The Indiana Fever huddle before tipff last month. 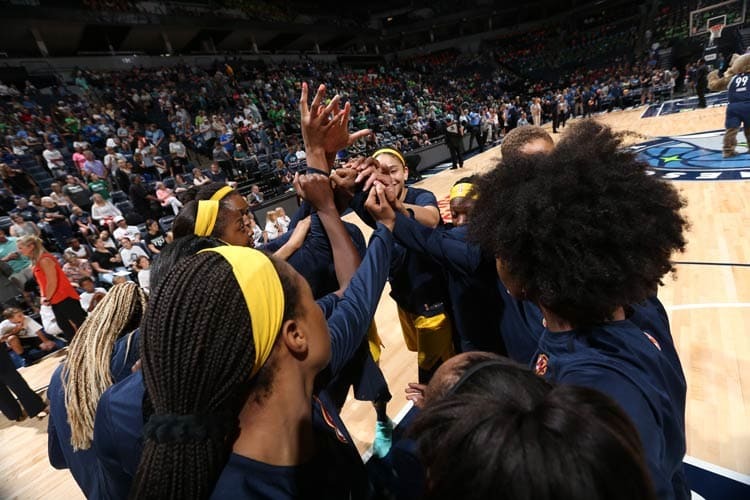 Photo courtesy of Indiana Fever/NBAE via Getty Images. They sometimes sing at the airport. They dance in their locker room at Bankers Life Fieldhouse. During their infrequent and precious down time, they often hang out together. Their practices are spirited, with lots of hustle, hard work and vocal encouragement of each other. They are a skilled group that gets better with each game. When they lose, they don’t get too low. When they have won, they don’t get too high. For so many reasons, the Indiana Fever don’t seem to match their league-worst 5-23 record. That balance of hard work and humor has kept the Fever going through the toughest season in franchise history. After going 9-25 last year in the wake of Indiana legend Tamika Catchings’ retirement, Indiana scored big in last spring’s draft. But with three rookies, other newcomers, and the loss of third-leading scorer Shenise Johnson to an ACL tear, the young team didn’t see its first win until June 16, 10 losses in. Yet, they have never stopped working for daily improvement, and that has yielded a few big rewards. 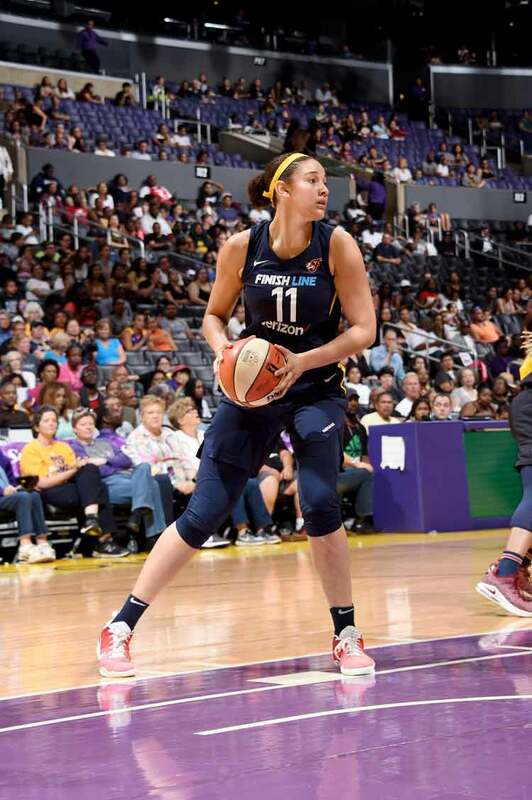 The Fever notched their second win by taking down the defending champion Minnesota Lynx. Two weeks later they toppled the Los Angeles Sparks. Now, coming back from All-Star break this week, Indiana finally has their first winning streak of the year, with victories over Dallas and New York. And with six games left in the regular season, players are undeterred and unphased by being eliminated from playoff contention. 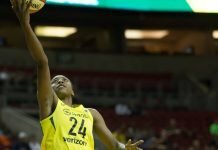 The Fever chose dynamic point guard Kelsey Mitchell second in the draft, forward Victoria Vivians at No. 8, and center Stephanie Mavunga with their 14th pick. But though they had the largest haul from the storied 2018 rookie class, that didn’t translate into instant success, for a few reasons. 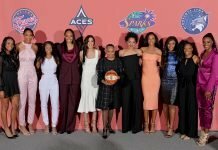 To begin with, this season was compressed to allow for the FIBA World Championship, which begins in September, meaning that the entire WNBA schedule is played in less time. As a result, every team has seen fewer practice hours, and rookies are often learning in-game. Achonwa doesn’t envy their predicament. 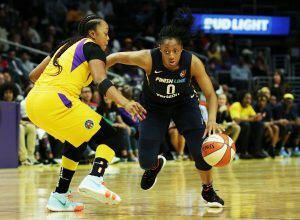 Another factor in the rookies’ stunted learning curve is that the level of play in the WNBA has never been higher, and every opponent is a true challenge. Coach Pokey Chatman said the newcomers have adjusted well, despite the tough circumstances. Natalie Achonwa has been the Fever’s undersized paint presence all season long. 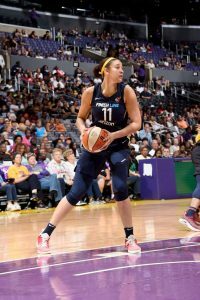 Photo courtesy of Indiana Fever/NBAE via Getty Images. A third obstacle, unique to Indiana, is that they are guard-heavy. This leaves the lion’s share of the paint work to Achonwa, who is not a center. 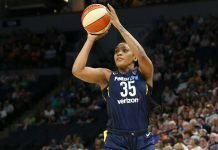 Issues arise in particular when 6-3 Achonwa is trying to guard reigning league MVP Sylvia Fowles, or Brittney Griner or Liz Cambage – both of whom are 6-9. The sophisticated scouting that teams employ now has also made the rookies’ jobs harder. 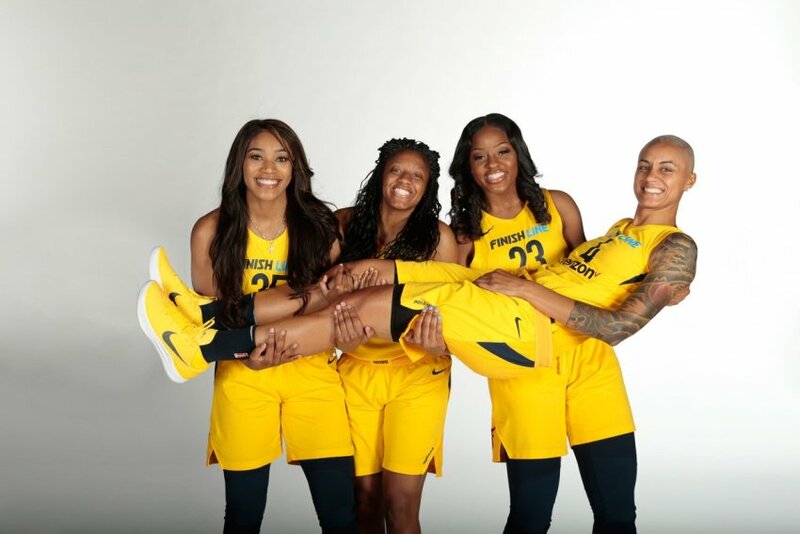 “People watched what they can do in the college game, so they know Tori’s a great catch-and-shoot player; they know that Kelsey going to try and get to the basket and she can shoot the three; and they know Stephanie’s going to get the boards for us,” Dupree said. Flashes of the team’s potential have appeared more and more as the season continues. And despite being often beat by double-digits and called “lowly” and “league-worst” in headlines, Indiana players remain upbeat. Chatman is especially impressed with that spirit in the rookies. From left to right, rookies Victoria Vivians, Kelsey Mitchell and Stephanie Mavunga, with veteran Candice Dupree. Photo courtesy of Indiana Fever. 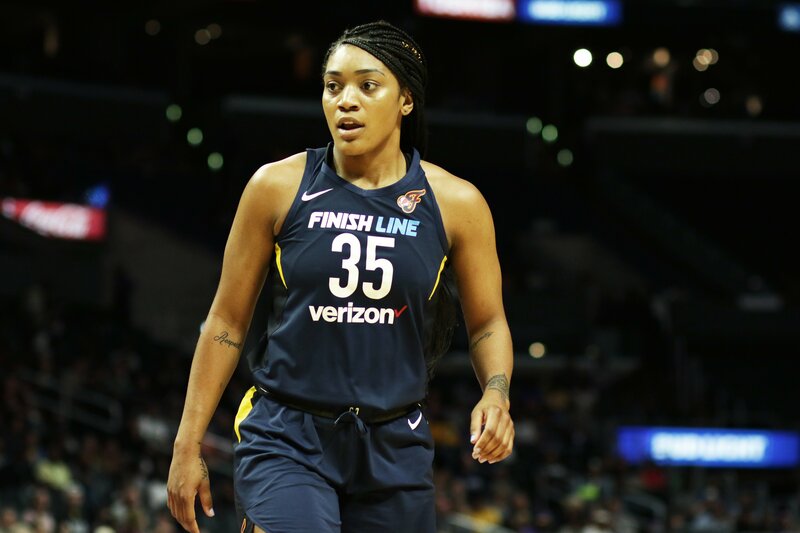 The mentoring starts with Dupree, whom the young players refer to as “Mama Candice.” Achonwa chips in, and jokingly refers to herself as “the strict parent.” Johnson comes to practices, travels with the team and “gets in their ear,” according to Chatman. Point guard Erica Wheeler also lends a hand, as has Cappie Pondexter since the franchise signed her July 1. All Fever players also meet regularly with Catchings, who is the director of player programs for Pacers Sports and Entertainment. She sometimes pops into practice, but talks with athletes individually to discuss a variety of player development topics. Mitchell is grateful for the opportunity to learn from one of the legends of the game. Chatman said the rookies’ “never say die” approach has lifted the entire team. Kelsey Mitchell is the second-leading scorer on the team, averaging 12.8 points per game. Maria Noble/WomensHoopsWorld. Mitchell finished her college career at Ohio State No. 2 on the Division I career all-time scoring list. She is known for her fearlessness in slashing to the basket and for creating scoring opportunities for herself. She has approached her new professional career thoughtfully and deliberately. Mitchell was coached by her father, Mark, throughout college. He taught her to be a student of the game, and to play intelligently. Mitchell is always seeking improvement. Mitchell was a starter for the Fever for the first third of the season, and had some strong performances. When veteran Pondexter was signed, Mitchell’s role became that of a reserve, where she is just as effective. She averages 12.8 points per game, behind only Dupree. Vivians, who led Mississippi State to two consecutive National Championship games, had a different path in that she began the year coming off the bench and worked her way into a starting role. She is averaging 8.5 points per game shooting 40 percent from both the two- and three-point lines. Coming into the WNBA was rough at first, however. Victoria Vivians moved into a starting role midway through the season. Maria Noble/WomensHoopsWorld. Like Mitchell, Vivians has tried to get to know both her teammates and opponents. Mavunga, who was a Buckeye with Mitchell, said she also has learned that she doesn’t have to shoulder such a heavy load. Chatman is particularly impressed with the development of Vivians. Not only did the newcomers bond from the beginning, but so did the team. At the beginning of the season, when they were losing, they made concerted efforts to attend events together. No playoffs this year means another high draft pick or two next spring for Indiana. And though they’ve had a rough entry into the WNBA, the rookies are eyeing the big picture clearly. Vivians has never lost her optimism.